"I highly recommend Bill for inspirational discussions regarding leadership, organizational and crisis management. He is: inspiring; possesses the rare ability to make tough decisions during crisis; resilient under pressure; understands consequences of decisions and the value of good information when making them." 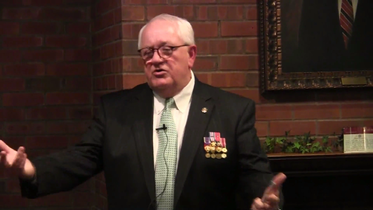 "Bill Albracht is a dynamic, engaging speaker and we were very lucky to have him on stage for our 2016 Quad Cities Army Birthday Ball in Bettendorf, Iowa. He was hands down the highlight of the event." Please see Testimonials page for more on these comments, and others. In addition to his military service, Capt. 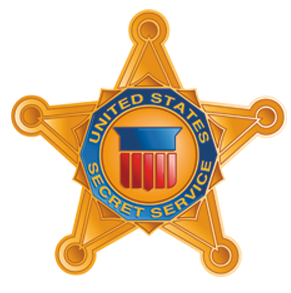 Hawk brings 25 years of experience with the Secret Service, 4 years heading up Ford Motors Security Division, and 13 years in private practice to his Security and Management Consulting services. 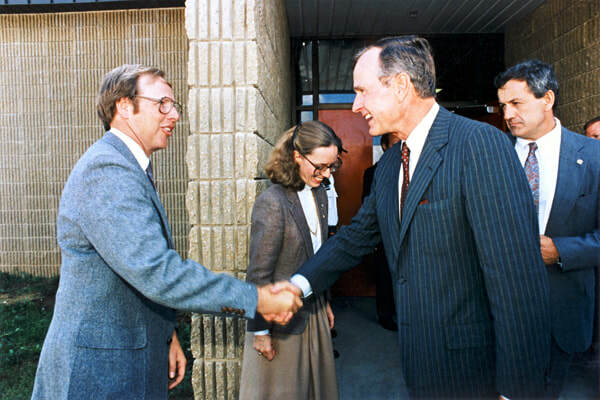 Pictured here: Hawk on VP Protection Detail for GHW Bush, whom he later protected when he was "41." Pictured at Eureka College, Capt. Hawk speaking on how living through dangerous situations can lead one to learn prioritizing skills, courage to take risks, and more, professionally and personally. His clients have described his speaking as "captivating," "dynamic," "inspiring," and "motivating." Connecting with the audience at book signings, appearances for the documentary "Escape From Firebase Kate," and other speaking/training events, is an aspect of his work that Capt. Albracht treasures. In turn, as people who come to see or work with him connect with Bill, they report Hawk has provided unique insights into a difficult war in U.S. history, reached other veterans on a deep level, and inspired listeners, from both the private and public sectors.